It was about 1 year ago that I originally found the Dosh smartphone app. I think I came across an ad for it on Facebook. At the time, the app was still fairly new and still working out the kinks. 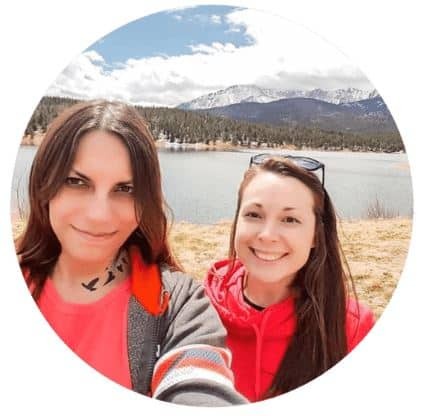 I remember I had trouble withdrawing the money from my Dosh wallet the first time, but the support team at Dosh was absolutely amazing at resolving that as soon as possible for me. After that I hadn’t had really any issues with the app and love using it. If you are weary of linking your card to this app, this Dosh review is sure to clear that up for you. 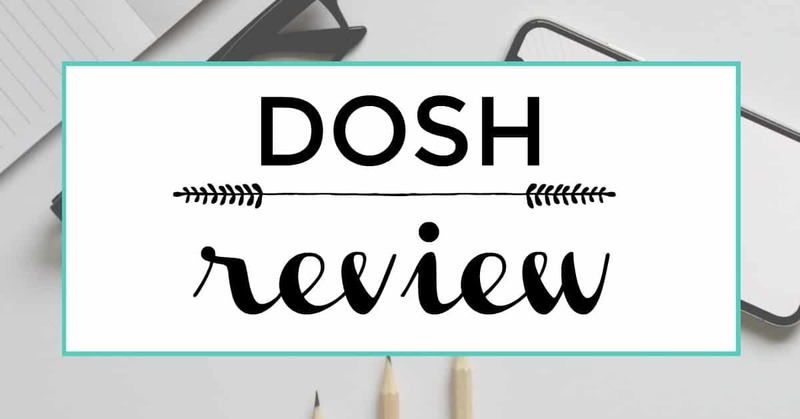 My Honest Dosh Review: Should You Link Your Card? Dosh is a cash back app but not in the way you are used to with other cash back apps. Instead of having to scan a receipt or mail in rebates, Dosh uses your linked cards to instantly apply cash back when you make purchases at participating merchants. 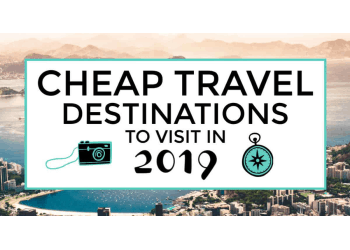 This includes shopping, dining out, ordering online, and even purchases at the gas station. After you sign up for Dosh, link a credit card and make a purchase at one of the qualifying offers. Then he app will instantly notify you of your cash back amount. That amount is then instantly applied to your Dosh wallet and available for withdrawal via paypal or direct deposit into your bank account. Pretty cool, right? Dosh is available for download on both Android and IOS and is completely free. After the app is finished installing on your phone, you are prompted to Login or Sign up. Signing up for Dosh is a simple process and includes your email, first and last name and chosen password. 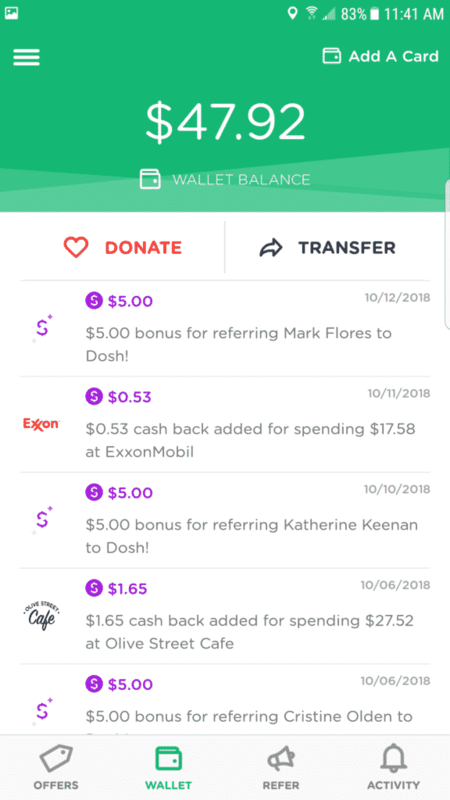 Once signed up for Dosh and you link your first card, you receive a $5 bonus in your Dosh wallet. Not too fast though, you can’t withdraw the amount in your wallet until you reach the minimum limit of $25. Once you reach $25, you can withdraw the amount in your wallet to either your bank account, your Paypal account or opt to donate it to a charity of your choice. 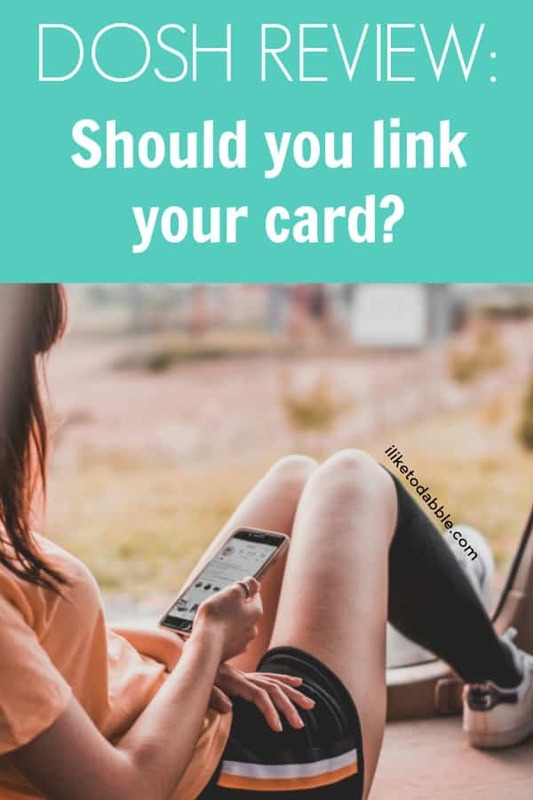 Should you link your card and trust them with your information? I am glad you asked because- yes! Dosh is serious about their security and protect every piece of data you share with them. They use SSL encryption, data safeguards, account authentication and complete anonymity so you don’t have to worry about them selling any of your personally identifiable information to third party companies. Dosh also does not store any of your credit or banking information. But why do they need your card information? Dosh securely connects to your credit or debit card so they know when you use that card and when an eligible cash back transaction goes through. This is how instant cashback is possible on the app. If you want to read more about their policies and agreements here. How can you make money with Dosh? 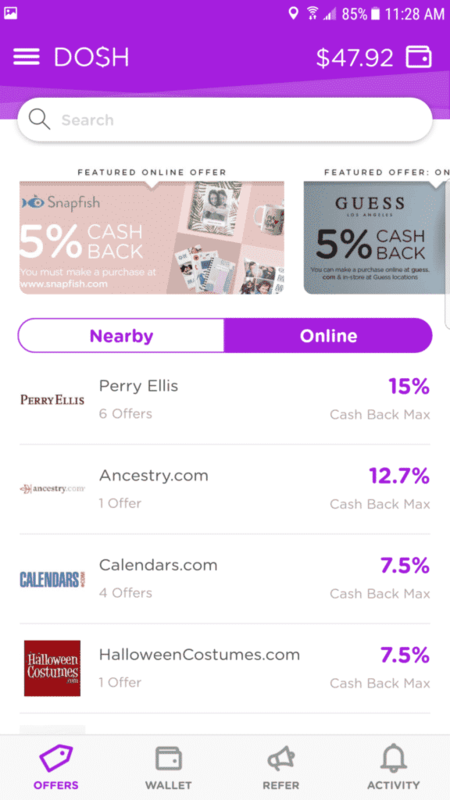 The first screen you will see when you open the app will the be Nearby Cash Back Offers screen. This screen is the list of the merchants in your area that you can get cash back for when swiping your credit or debit card. 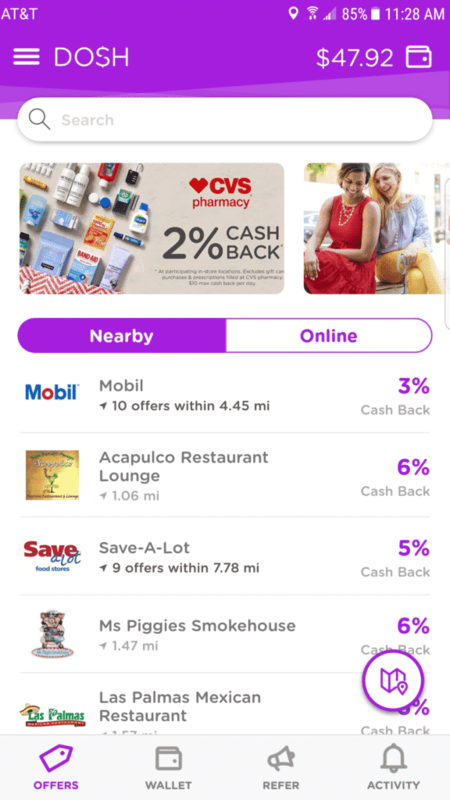 The nearby cash back offers in my area tend to hover around 6% but I have seen a range of 2%-10% for local gas stations, restaurants and retailers. For example when I see the Mobil has a 3% cash back offer in my area, I use the card I linked to in Dosh for my gas station purchase later that day. About 1 second to 5 minutes after the purchase, I get the cash back right in my Dosh app! It will show up as a notification saying that I ‘got dosh’. Take note that when you make a purchase at a gas station like this and are prompted to run your card as debit or credit, always opp for the credit option. You will not get your cash back when running as debit. This is a very important aspect to note as you read through this Dosh review. Next to ‘Nearby Cash Back Offers’ menu item at the top, you will see a tab to click for Online Cash Back Offers. The online offers are much different in how you earn your cash back for them though. For you to receive cash back for any of the online offers, you must make the purchase through the Dosh app. After the purchase in complete, your cash back will appear in your Dosh wallet in about 60 – 90 days. I have seen the online offers range from 1.5% to as much as 22.5% cash back. 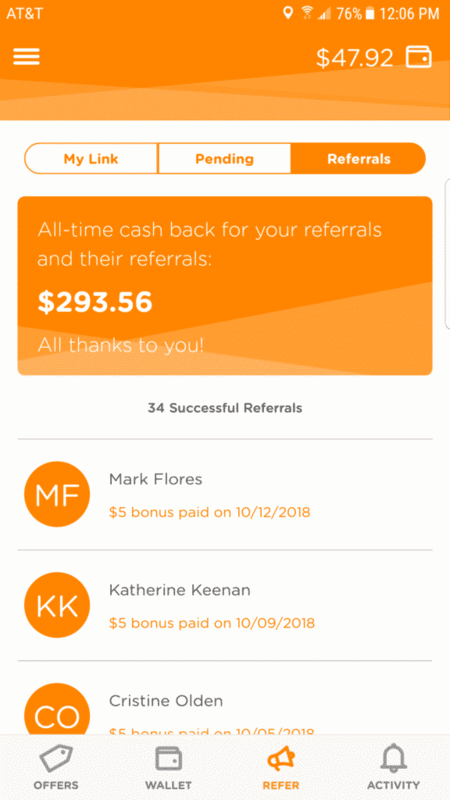 Dosh also has an amazing referral program that gives you the opportunity to earn $5 for every person you refer to Dosh. 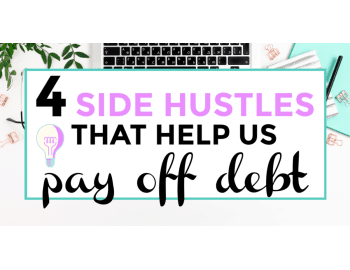 You are not paid the $5 until that person links their first card. 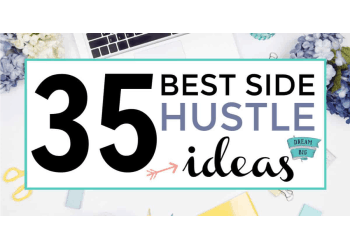 Sometimes Dosh runs different campaigns throughout the year though when sometimes the referral rate gets increased to $10 per referral and even $25 per referral. I love that they fluctuate this depending on what promotion they are running because it gives their users a real fun earning opportunity. You earn a $5 bonus for the first card you add to Dosh after signing up. For the next 2 cards after your first, you can earn $1 each. This goes for both debit and credit cards (be sure to always run your debit card as credit when you purchase a cash back offer). Dosh pays you via the Paypal or bank account information that you enter into the ‘Accounts & Cars’ section under the 3 line menu icon on the upper left hand corner of the app. However, you will not be able to enter this information until you reach the $25 minimum limit in your Dosh wallet. Once you reach that amount though, you will be able to enter or link your bank account or Paypal account. 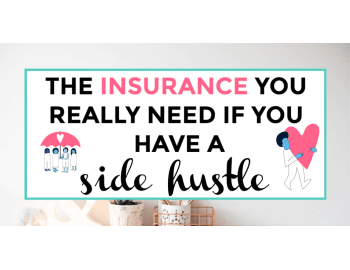 Depending on how you want to get paid, of course. The first time I did this I had trouble withdrawing to my bank account. I was more than pleased with the support when I contacted them about the issue. They responded and resolved my issue within that same day. When you are on the Dosh wallet screen with enough to withdraw, you are presented with two options. One to transfer to either a bank account or Paypal account. And one to donate some of your earnings in your Dosh wallet to a charity of your choice. The majority of our earnings with Dosh has been from referrals and cash back offers with a high percentage. But we also earn money on the app with nearby gas station offers, shopping and restaurant offers, and online offers. See the below screenshot that states how much cash back and money earned on the app during 2018 and since I joined the app. 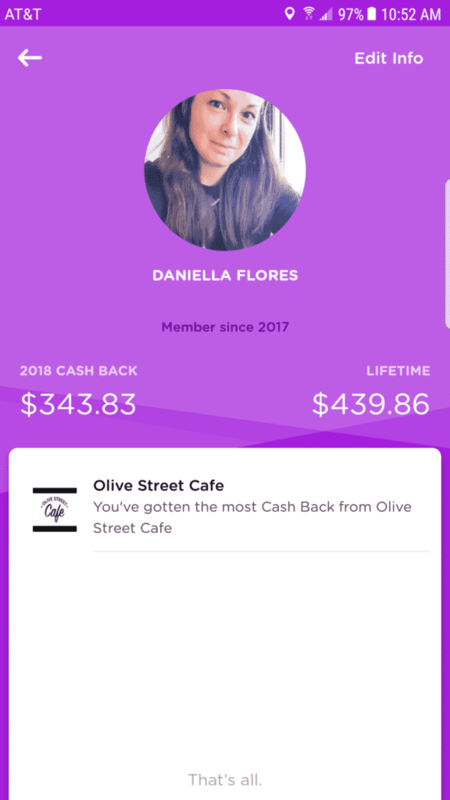 As you can see, we have gotten most of our cash back from Olive Street Cafe, this amazing place you must stop for breakfast at if you are ever in the St. Louis, MO West County area. We have probably earned more in referral earnings though, but this screen doesn’t show that. See the below screenshot showing the lifetime earning from our referrals on Dosh. Where can you use Dosh? You can use Dosh at participating stores locally nearby or online. Below are some current nearby offers and online offers that appear on my app. Along with the percentage of cash back I would get if I made a purchase there today. What I love most about Dosh is that the offers are at merchants that I would actually go to and order from. The fact that I am able to get cash back not only for my shopping and dining but also for my gas, my pets if I order from Petco online and when I do my taxes with TurboTax. Talk about super convenient! The referral rate at $5 for each new user I refer that links a card is also pretty nice. Some other apps do not offer as much of a referral as this one does. The support team at Dosh is also incredible. Every time I have spoke with them they made it their duty to get back with me and resolve my problem as soon as possible. There was no one being left in the dirt like some other support situations I have had with other apps (where I don’t hear back for weeks). 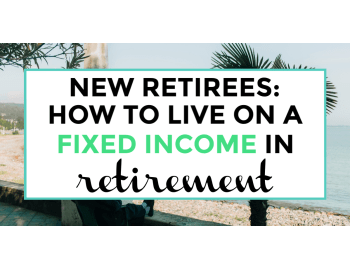 Their support personnel really takes the time to talk to you and understand as much of the problem as they can so they can go about the path to resolution. The app does not make it 100% clear anywhere when you are just starting out that when you make a purchase at any of the nearby offers to run your debit card as credit. I found this out the hard way of first running my linked card as debit at the gas station and didn’t get my cash back. Then when I referred to the support section of the app under ‘Dosh Consumer FAQs’ where I saw the resolution for not getting credit for a cash back offer. When using a debit card, you must run it as credit in order to receive the offer. This is because debit transactions go through your bank and the transaction must go through the credit card companies that the card is linked with in order to receive cash back. We also were not 100% thrilled with the online offers. It isn’t the easiest user experience to have to go through the dosh app to make an online purchase to get one of the cash back offers. I rather make whatever online purchase I want that qualifies as one of the offers listed and instantly get my cash back like I do at the nearby locations. Dosh use to have a section of the app for travel purchases which I LOVED but they have since gotten rid of that feature. I got $25 cash bonus for using it to book my first hotel which I did last year around Halloween when we went to New Orleans, LA. I also got cash back for the amount I paid at the hotel for our night’s stay. I would love if they added the travel feature back in to the app or create a separate travel rewards app like Dosh. I guess we will have to wait and see. Yes Yes Yes! You should absolutely try Dosh. As you can see by this Dosh app review, we are pretty smitten with it. Let’s talk about the total amount I have already made with the cash back app without really trying. I mean, seriously!? Dosh is a win-win. This app is the easiest way to get some of your money back from purchases. It’s nice to make a little extra on the side by referring friends and family to save money too! Plus, the app really goes out of it’s way to show you the secure actions they are taking with your data and that there is no reason to be concerned. 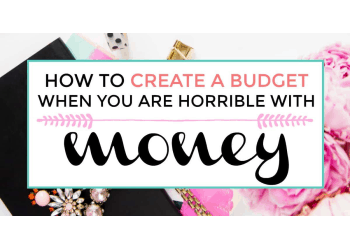 Dosh is quite the life hack and finance hack. Download Dosh here and get your $5 bonus upon linking your first card! Swagbucks: Swagbucks is where you can earn points called swagbucks or SB that transfer into real dollars. Earn money by taking surveys, shopping online, watching videos, discovering content or downloading other apps. Every 100 SB = $1.00 USD. Earn a $5 bonus just for signing up! Install the Swagbucks Swagbutton extension to your chrome browser here and get a $10 bonus! What other cash back apps have you tried and loved? Tell us about them in the comments! Thanks for sharing, because people are often worried about the level of security with Apps and whether or not they are really effective at earning your money back for things you already do. Very detailed, great article.